Hilton unveils updates to its loyalty program. MCLEAN, VA—Hilton has revealed updates to its guest loyalty program, Hilton Honors, making it easier for members to earn points and unlock rewards. 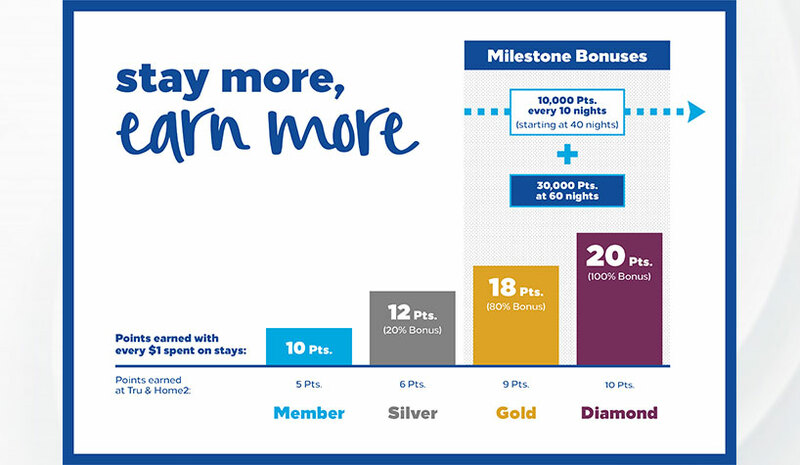 Starting in April, more than 70 million members of Hilton Honors will have new perks, including the highest elite point earning potential in the industry, the option to rollover nights and the opportunity to gift status, according to the brand. “We have heard our Hilton Honors members loud and clear—they are looking for simple, straightforward ways to earn more points and rewards the more they stay with Hilton. Now more than ever, every stay counts—there’s always another milestone to reach, benefit to unlock, reward to earn,” said Mark Weinstein, SVP and global head of customer engagement, loyalty and partnerships at Hilton. These program changes were designed in direct response to member feedback. “Over the last several years, we have been evolving Hilton Honors to ensure our members receive the best hotel stay experience with perks like free WiFi and member-only rates when they book directly with us. Last year, we introduced even more ways for members to use their points with more flexibility and ease, including Amazon Shop with Points and Points Pooling. Now, in 2018, we want to give our members more ways to earn their points and show our loyalty back to our most elite members,” continued Weinstein. Starting in April, Hilton will update how members earn points. All members will continue to earn points the way they always have, while having new elite tier bonus rates for Silver (20%), Gold (80%) and Diamond (100%) members. Hilton Honors members will earn 10,000 bonus points on every tenth night, once members reach at least 40 nights in a calendar year. It’s not a limited time offer, no registration is required and there is no cap—the more members stay at Hilton, the more points they earn. In addition, for Diamond members, there is an additional bonus at 60 nights in one year—a 30,000-bonus points reward. Starting this year, Silver, Gold and Diamond members can rollover qualifying nights earned beyond their current elite tier requirements to count toward their elite tier status the following year. Members staying 60 or more nights in a calendar year will also have the ability to gift Gold status to their favorite travel partner. Stay 100-plus nights and that gift gets upgraded to Diamond. While many of these changes begin in April, several new benefits and ways to earn are already available to members. In addition to breakfast perks at a host of Hilton brands, Gold and Diamond Hilton Honors members now receive complimentary continental breakfast or a food and beverage credit at all of Hilton’s luxury properties, including Waldorf Astoria Hotels & Resorts. Beginning, Jan. 18, members will also have access to four new American Express co-branded cards.